You might recognize The Unsinkable Molly Brown as the moniker of possibly the most famous Titanic survivor, but the fact is that “Molly’s” real name was Margaret Tobin Brown. 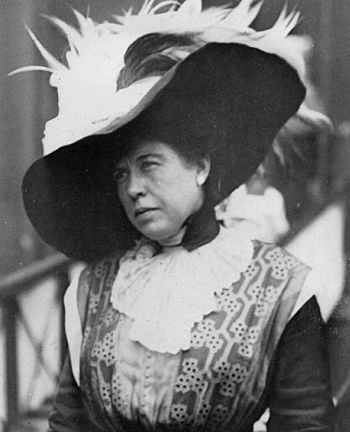 She’s been featured as a bold, audacious character in multiple Titanic movies, and though she’s certainly best known as a survivor of the Titanic sinking and the source of some snappy quotes, Margaret Brown was an influential socialite and activist who fought for the rights of women, unions and the needy. This condensed biography might help to dispel a few of the myths and solidify the facts surrounding this truly “unsinkable” survivor. Margaret Tobin Brown was never actually called “Molly” during her lifetime. That nickname came about from the “Unsinkable Molly Brown” movie and stage musical in the 1960s. Born in Hannibal, Missouri as simply Margaret Tobin, “Molly” moved to Colorado at the age of 18, hoping to marry into money. Instead, she fell in love with James Joseph Brown, a mine supervisor who was just as poor as she was. 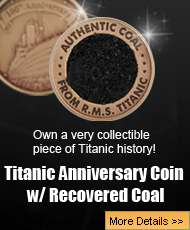 But when J.J. struck gold, the couple became quite wealthy. The lavish house that they moved into together is now a public exhibit celebrating Margaret’s life. Margaret had been traveling in Europe with her daughter Helen when she received word that her grandson was ill. Wanting to get home to America as soon as possible, she boarded the RMS Titanic, unaware of the disaster that would soon transpire. When the Titanic struck the iceberg on April 14, Margaret did her best to help people onto the lifeboats before boarding Lifeboat No. 6 along with other passengers and one of the ship’s quartermasters, Robert Hichens. When Hichens refused to turn the lifeboat around to rescue other survivors, claiming that those floating in the water were merely “stiffs,” Margaret fiercely argued with him before finally seizing control of the rudder and ordering the other passengers to row back towards the wreck. When Hichens continued to protest, Margaret threatened to throw him overboard. Not wanting to try his luck swimming in the ice-cold water, Hichens kept his mouth shut. Eventually, Lifeboat No. 6 was rescued by the Carpathia. Margaret was instrumental in assisting survivors. Before the Carpathia had even arrived in New York, Margaret had raised nearly $10,000 from the first-class passengers to go towards those who had lost everything in the Titanic wreck. Margaret acquired her famous title after delivering a sly quote to reporters soon after the Titanic disaster: “Typical Brown luck. We’re unsinkable.” Her newfound fame as a Titanic survivor made Margaret’s philanthropy and activism efforts even more successful, and she even dabbled in acting. Her fortune gradually dwindled, and Margaret Tobin Brown died in 1932 at the age of 65.